Las Vegas, NV- The 75th annual Wine and Spirit Wholesalers of America convention took place this past Tuesday and Wednesday, inviting thousands of trade professionals under one roof to network and build their businesses. 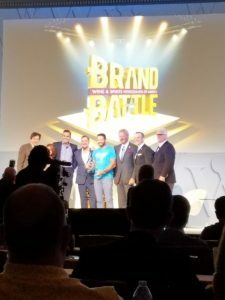 Highlighting the program was the signature Brand Battle, an opportunity for brands to share their story in front of industry experts and compete for the best brand. The judges announced seven top brands as the winners of the battle, four of which are proud Park Street clients. Gray Whale topped the charts at number one, a gin specially curated by Golden State Distillery. Runner-up was earned by Rose Piscine. Blue Marble and Unicorn Tears also championed the top 7 list.